If you haven’t read Brendan’s post over at Necropraxis about ablative armor then you should do so. I’ve been looking for something like this for awhile - something that keeps combat intense without having to deal with a sort of +1 arms race in combat. I wanted to playtest it and recently Lindsay had some co-workers who wanted to get a game together. So perfect timing to try out some new stuff on them since they won’t be super inclined to be graceful. I’ve also been wanting to dive deeper into my Nilvein campaign - which is basically a Castlevania Megadungeon (with some Vampire Hunter D, Ravenloft, Stonehell, Dark Souls, Gormenghast, Berserk, you get the point). I’ve got another group about to go in as well, and I want the groups to interact a little. 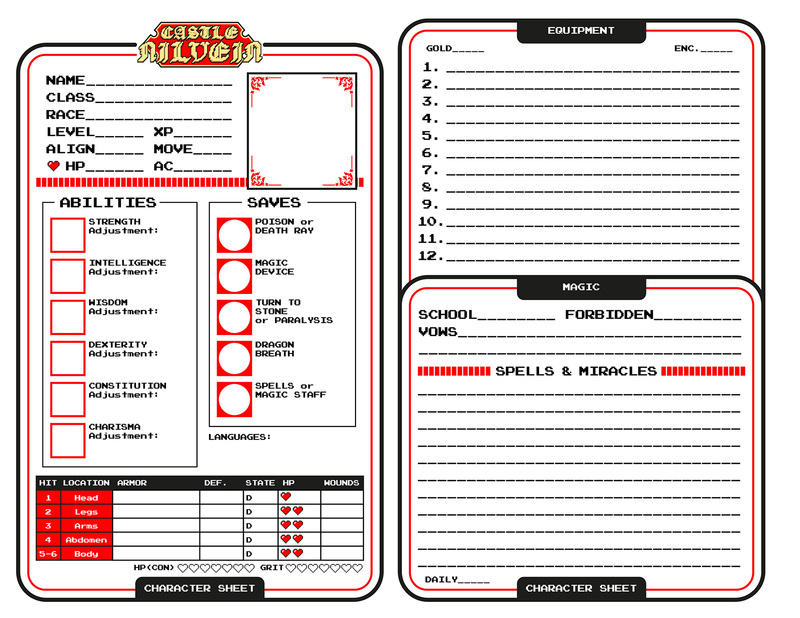 Blank Nilvein Character sheet with the portion about armor stolen completely from Necropraxis. 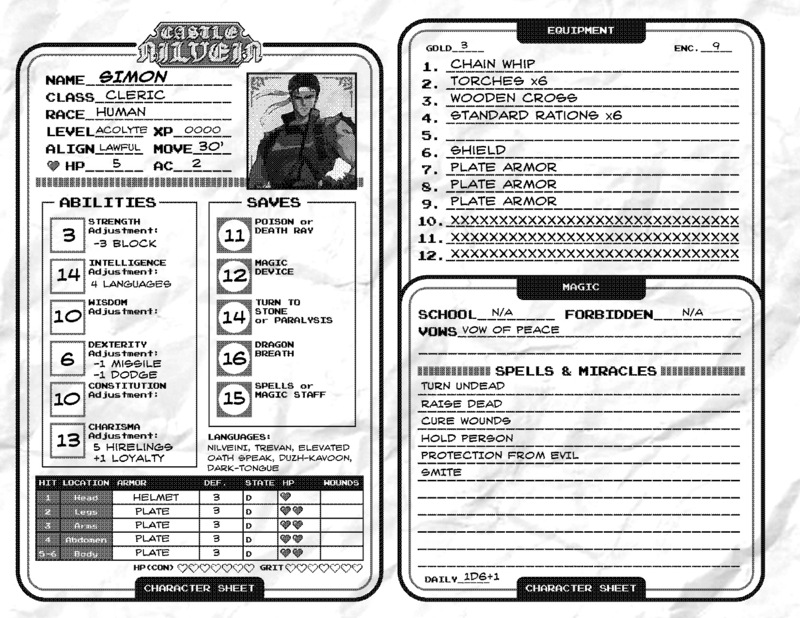 With all the house rules I’m accumulating, I figured it’d be more fun to just make some custom character sheets to get people in the right mindset. You can download the full res version here. Another big thing I’m going to playtest is my build for Clerics. I’ll do another write-up on this, but the big thing is that Clerics have to take solemn perpetual vows (1 per level or every other level depending on how long your campaigns run) which they must rigorously follow, else incur divine retribution (disapproval from DCC) from their god(s). These vows remove options for the clerics in play, making the game harder for them. The one I can see annoying people the most, for instance, is the Vow of Peace, which when undertaken gives the Cleric access to all the healing spells and turning of undead, but however, means the Cleric can no longer attack (or cause harm to by like setting a trap - a lot of judgement and rulings are going on here I’m sure) creatures other than demons, the undead, and a hated enemy of their god. It’s annoying, for sure, but it’s the only way to get healing so. Different vows give access to different spells and spell-like abilities (like schools of magic). Here’s my first try at a character with the new sheet, just to make sure everything fits together the way its supposed to. The Clerics’ spells that I’m using are going to be levelless a la Wonder & Wickedness which is what I’m currently using for my Magic Users. The big driving factor behind a lot of this stuff for me is that I don’t get to play that often, and so I need things to happen faster in my games - faster travel, faster combat, more access to cooler tools at lower level, that kind of thing. I’d love to run a account-for-every-pound-search-every-hex kind of game, but that’s not the game that I have right now! Also, I got to play in my first g+ OSR online game the other night, which was a ton of fun and I hope I get to do more of that in the future. As a side note, I’ve also been running this blog for a year now. Yay! I started out with a goal of just one a month, which I almost hit besides a month in October. Minor milestone, but still pretty exciting. Primarily, this blog was meant to talk mostly about building my company, Tuesday Knight Games, but recently it’s mostly been RPG stuff. That’s fine with me, and I’m sure I’ll have more to say on the boardgaming front as we move into the year and deal with more kickstarters and conventions. Stay tuned.